Marcus and I met up with Linda and John for brunch during early January at Chef Jean-Georges Vongerichten's relatively new ABC Kitchen in the Flat Iron District. It is housed somewhat inside ABC Carpet & Home (thus the ABC in the restaurant's name). 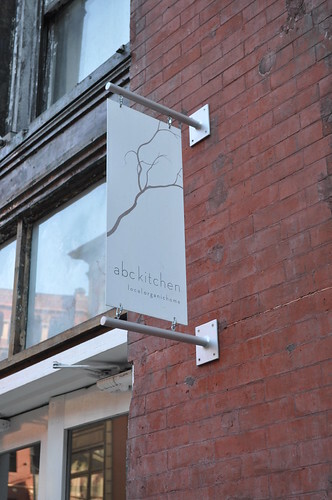 ABC Kitchen's main focus is "regionally-grown, organically focused cuisine that is rooted in cultivating a safe relationship with the environment and its table" as well as "committed focus to local, sustainable and organic seasonal produce." 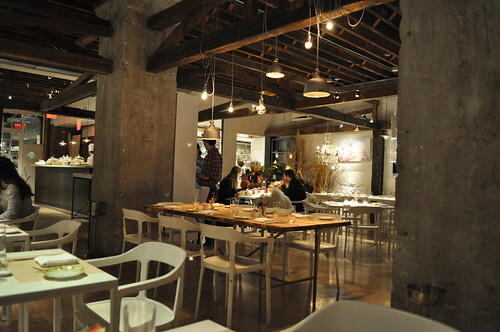 The interior of ABC Kitchen displays a certain modern cottage chic. You feel like you're inside a quaint cottage with modern furniture and the like. I really like the selective lighting as well. It creates a little private space for each party of guests, giving the illusion that the restaurant is more spacious than it actually is. 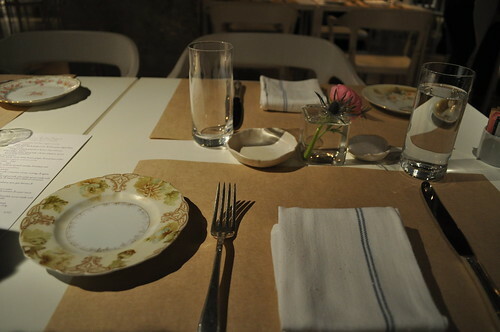 The table setting at ABC Kitchen. The plates are mismatched and varying (a nice touch, I say), with country-vintage vibe to it. I also like the parchment paper place mats. It goes well with the organic, "locavore" philosophy embraced by ABC Kitchen. In fact, the dinnerware is handmade by local artisan, Jan Burtz. 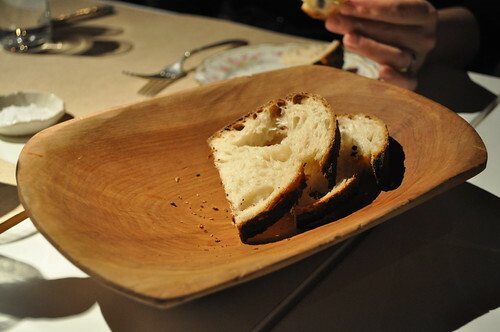 Even the bread plate is made from wood! The bread is made fresh daily. Linda and John started off brunch with a blood orange bellini each, while Marcus and I each had an Arnold Palmer, which consisted of freshly brewed iced tea mixed in with hand-squeezed lemonade. 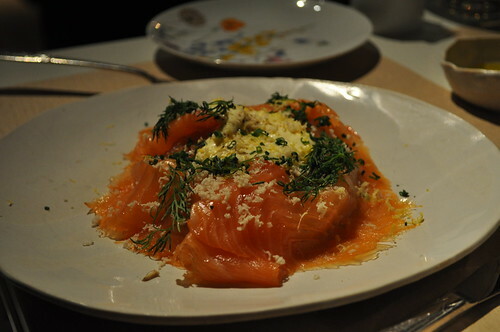 Marcus started with the smoked Salmon on a toasted bagel with cream cheese. Very simple in flavor as well as the classic brunch meal. Only complaint on Marcus's end was that the bagel was a little small. Other than that, it had fresh flavors and was very light. 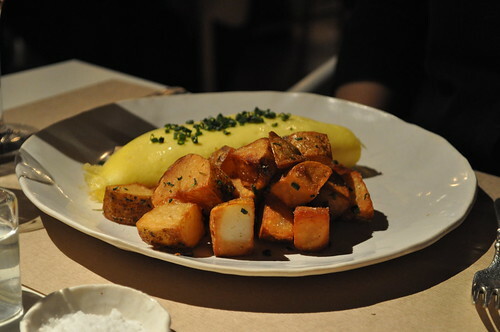 Let me interject here to inform you how poor the service was during our brunch at ABC Kitchen. As you've probably learned from reading past blog posts, I am a mushroom fiend. When I saw this pizza (below) on the menu (i.e., one covered in various wild mushrooms), I was totally game, until I saw that it contained Parmesan cheese (one of my few enemies in the food world). I noticed other dishes on the menu contained mozzarella, so I thought it would be a fair question for me to ask if I could have it substituted. When our server returned back to our table to see if we were ready to order, I said I had a question for her, addressing my wanting to substitute the Parmesan in the mushroom pizza with Mozzarella cheese. She just looked back at me blankly, replying in the quietest voice I've ever heard. Stefie: Can you repeat that, please? Server: [in a slightly louder, but not by much, voice] I'm not sure if the chef will be able to accommodate that. You see, the dishes are usually served as is... [more silence] Do you still want it? Stefie: Oh, if that's the case, then just come back to me. I'll choose something else. Server: [interrupts, with her ridiculously quiet voice] Oh, I was going to put in your pizza. Stefie: Um, okay...just let me know? Server: [gives me a nasty look and walks away] Sure. What attitude! I was sincere and pleasant to her from since we arrived at our table. What the heck was her problem?! It was just a simple question! Definitely one of the most awkward exchanges I've ever had with service in a fine restaurant. Marcus, Linda, and John even had major issues hearing her. And to top it off, Marcus had no idea any of the above happened until I explained it shortly after. Minus all that crap, the kitchen was able to substitute cheeses for me (ha!). It is the mushroom whole wheat pizza with with fresh mozzarella (change, courtesy of an easy substitution, haha), oregano, and farm egg. 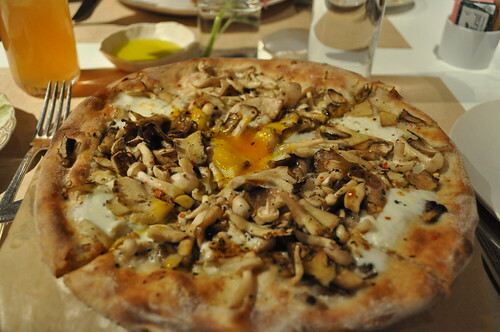 I liked that the egg yolk was still runny and that it was completely loaded with mushrooms (a total win!). My only complaint here was that the pizza was pretty soggy, most likely attributable to the water emitted from the mushrooms. Also, I wish it were served at a slightly warmer temperature. 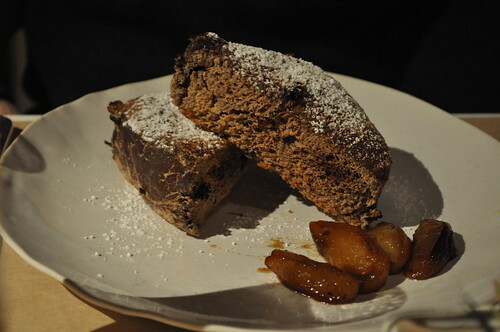 John ordered the french toast with roasted apples. Puffiest french toast I've ever seen! I recall John reporting that it was very good! 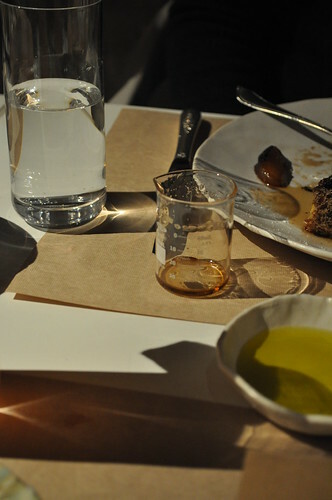 They even served his syrup in this cute little beaker. Linda also had some communication issues with our server. She inadvertently added ham to her omelette with what I remember to include goat cheese and spinach. She wanted it strictly vegetarian style, so she just told our server she'd push them off to the side. Linda enjoyed the remaining omelette as best she could. I think dessert made up for the mishaps during the earlier part our meal. 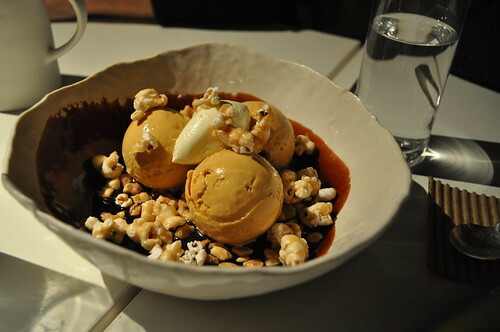 Linda and John were full from their previous meals, but Marcus and I went for the sundae with salted caramel ice cream candied peanuts and popcorn, whipped cream, and chocolate sauce. This wonderful combination of old-fashioned ice cream parlour treats tasted just like a Snickers bar, only deconstructed! You had the bittersweet flavor from the chocolate sauce, the sweetness from the salted caramel ice cream, and the sweet-and-salty crunch from the popcorn! This dessert is meant to be shared by two or more people for future reference. Findings: Chef Vongerichten and along with Phil Suarez (a loyal dining patron, who later became the financier behind his culinary ventures such as Spice Market, Jean Georges, and Perry Street, to name a few) have created yet another beautiful space to add to their portfolio of fine dining establishments. I admire the restaurant's open commitment to sustainable and locavore-culture dining. The only thing I will have to point out at how poor the service was. I understand it's brunch--not necessarily the same scene as it would receive nightly, but that is no excuse for attitude and cheekiness. I sincerely hope that the service we received that afternoon was just a fluke and that any possible future visits will be a million times better than that. Nevertheless, ABC Kitchen is a lovely space to go to with friends on a Sunday morning, but with a grain of salt, because you'll never know what kind of serve you'll get. 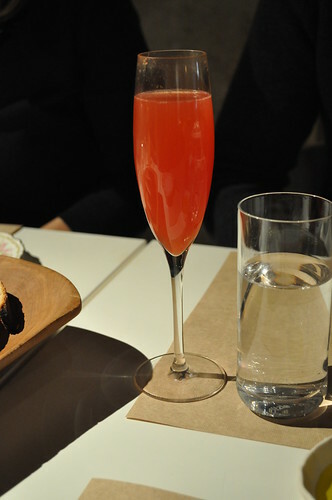 Cocktails are a must, and dessert should not be skipped. Price point: $13 for a cocktail; $15-18 for each brunch entrée; $8 for dessert.